Home > Personal Details > What is Identity Theft Fraud Alert? Becoming a victim of identity theft is no fun. Not only will you spend countless hours trying to minimise the damage, but you could face an uphill battle in trying to assess the damage to your credit score. In fact, some people only discover that they have become a victim of identity theft when they are turned down repeatedly for credit. When they finally gain access to their credit report, they learn that fraudulent activity has taken place that they were completely unaware of. 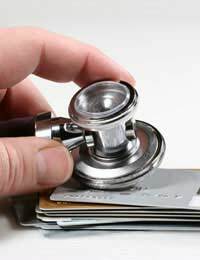 If you are worried that you have been the victim of identity theft, or even if you are worried that you could become a victim sometime in future, it can be a good idea to put a fraud alert on your bank account with one of the three major credit reference agencies, online or on the phone. A fraud alert, in effect, will flag your account for any suspicious activity or fraud. That means a lender will have to contact you directly before anyone opens an account or credit card in your name. If you are not contactable, the account will not be opened. When you register with a credit reference agency and ask for a fraud alert to be put on your file, they will contact you when any potentially suspicious activity has taken place on any of your accounts. The three main credit reference agencies in this country all exchange information with one another, so be aware that when you register with one, the others will know what is going on as well. They will also give clients who register for the fraud alert online access to their accounts, so they can look and monitor any suspicious activity, much like people do with an online bank account. Some will send you a weekly report by email or SMS, so you can keep up with any changes that may or may not appear. Keep in mind that when you place a fraud alert it will expire after 90 days, so to keep it up-to-date you will have to consistently reactivate it once it has expired. Credit reference agency Experian has reported that a study from CIFAS has found that it takes victims of identity thefts about 15 months on average to discover that they have become a victim in the first place. Cleaning up the mess and clearing your name, it says, takes about 300 hours. The good news, according to Experian, is that we are becoming more aware of how to protect our identities from theft – and what to do about it should they become stolen. In fact, about two-thirds of victims discovered the crime themselves when they checked their credit reports, it said. To avoid being a victim of identity theft, take the usual precautions. Never give out personal information out over the phone, shred all personal documents, and ask for individual letterboxes if you have a shared post collection point, so your documents do not fall into the wrong hands. Be careful about the information you and your children divulge on social networking sites, and register to vote. If you are on the electoral role already, a fraudster cannot register your name elsewhere. It is also a good idea to check your credit report regularly, and if there is a problem, to ask for a fraud alert on your account. When it comes to identity theft, it always pays to be safe than sorry. Taking the sensible precautions and acting quickly should anything untoward show up on any of your accounts is the best way to prevent becoming a victim. What is Text Messaging Identity Theft? I had my purse stolen and my national insurance number and driving licence was in it. Is that enough for someone to use for fraud ? If so how do I report it properly ? You would have to report a theft directly to the police by telephoning 101, which is the police non-emergency number. I gave my national insurance number out today to retrieve a pension I have, have I done the wrong thing? They called me and said that they can retrieve it for me. Please a friend collected a copy of my CRB that she was going to register a company. Please I am a nurse how would I know if my identity is been used somewhere? @CIAWA - you are probably better speaking to the HMRC directly. The National Insurance enquiries number is 0300 200 3500. I hope this helps.